Is Alejandro G. Iñárritu’s The Revenant a joyless, two-and-a-half hour slog, consisting of revenge, death, wilderness survival, and bear attacks? Not when you add some classic graphics and sound effects and turn it into a video game in the great tradition of Tony Hawk’s Pro Skater. That is exactly the premise behind “Leo DiCaprio’s Pro Revenant,” a high-concept new short film from video madman Dominick Nero. What Nero has done with this two-minute video is to transform Iñárritu’s epic from a grim, Oscar-nominated drama into “a fun extreme sports game that award[s] players for completing cool tricks and doing generally destructive things,” just like the beloved skateboarding simulator of yore. 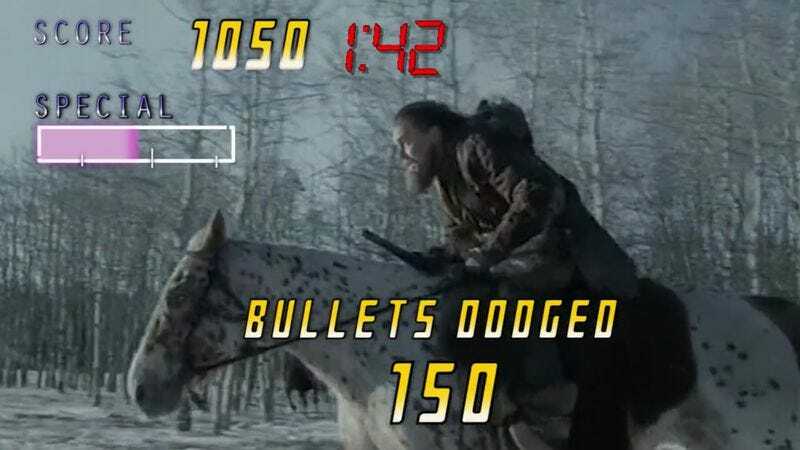 Here, Leonardo DiCaprio’s Hugh Glass is a playable character with a simple mission: avenge his dead son. The player has all sorts of options, especially as far as locations go. Leo can seek vengeance in a cold river, a cold tundra, some cold woods, a cold mountain, or a warehouse. Fun, right? Since subtlety was clearly not the concern for director Alejandro G. Iñárritu, and the film itself awards DiCaprio’s character for performing rad survival tricks (fighting bears, jumping horses, killing Native Americans, etc. ), The Revenant somehow seems like a torturous session of [Tony Hawk’s Pro Skater], as the fearless Hugh Glass rampages through a landscape full of steep inclines and big drops, collecting power-ups like raw bison organs, and dodging Native American arrows with style. In the game footage provided here, Leo manages to show off several sweet moves, including the Horse Slap and the 180 Head Spin. Unfortunately, those are not enough to gain him victory this time around. But, as the clip points out, accumulating 3,000 points will finally nab him that elusive Best Actor award. Leo DiCaprio’s Pro Revenant from One Perfect Shot on Vimeo.